The wireless flat panel integrated into the 32 kW X-ray system is designed to give maximum performance and flexibility within a modern hospital environment. The speed of operation of this system, in fields demanding rapid intervention such as Emergency and Pediatric Medicine by virtue of the 2 second display time for images at the console provides excellent clinical worth. The new wireless FPD expands the product range and allows easy positioning in restricted spaces when combined with the intuitive movements of the MobileDaRt Evolution. The newly adopted vibration resistant SSD capable of high speed access achieves high level reliability during clinical rounds and a smooth system startup. Images can now be checked quickly from a wide range of positions around the unit, which further improves workflow. LEDs have been adopted as the light source to indicate the irradiation field. This reduces power consumption while improving brightness levels and durability. The wireless FPD makes it easy to maintain the system asepsis in the operating room or infectious diseases ward. The system offers excellent positioning, with no concerns about cables. Two kinds of dose management tools are available according to the needs of facilities. 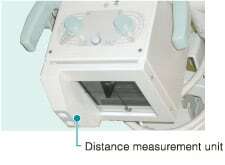 A Dose Area Product (DAP) meter can be mounted to the front of the collimator to display dose measurements on the display panel. If a dose calculation function is incorporated in the system, the estimated skin dose is displayed on the main unit display panel prior to taking exposures. Dose data measured with a dose area product meter or calculated skin dose can also be output in DICOM format. Two types of digital system are selectable. The optimized workflow reduces steps and supports multiple study acquisition. 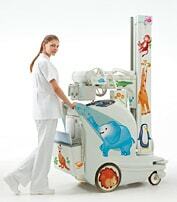 With radiography of children and emergency cases where it is difficult to maintain a stable posture, there is a tendency for images to be blurred due to patient movement. With MobileDaRt Evolution, a maximum output of 32 kw allows for shorter exposure times, eliminating blurring issues. A light pressure applied to the drive handle moves the mobile system in a natural manner as if it were an extension of one's hand, allowing the MobileDaRt Evolution to be controlled easily and effortlessly. The MobileDaRt Evolution can be moved forward or backward by using the bedside drive controls located on the front of the collimator. Safety is a major consideration and any sudden force applied to the handle during "Inch-mover" operation stops the MobileDaRt Evolution automatically. 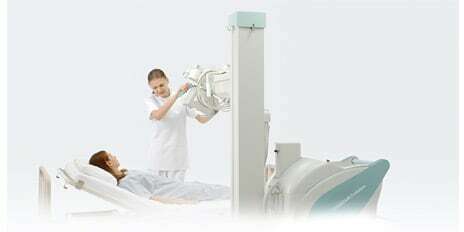 In addition, X-ray irradiation is also automatically disabled during any movement of the MobileDaRt Evolution. Setting a password for each user enables keyless use of the system. The Key-less Entry enables to turn on the system by 4 digits key command input without any actual key, which is useful to share the units by several staffs. 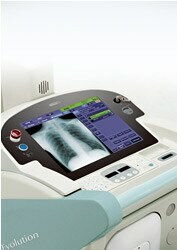 Standard MobileDaRt Evolution features include support of DICOM print and storage. Output data in DICOM format to a laser printer, image server, or viewer using the provided LAN connection. Optional wireless network connection is available that provides even greater freedom for communication to RIS or PACS while moving the unit.